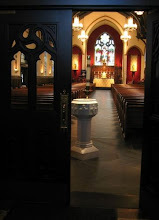 This year our parish will be 160 years old, and as American institutions go, that is a venerable age. But our Church is 2,000 years old, and Christianity stands in continuity with the 2,000 years between the calling of Abraham and the coming of the Lord Jesus. And in the 4,000 year history of Israel and the Church, we have seen empires rise and fall, tyrants come and go, nations be born and die, whole civilizations wax and wane -- all of which means that we can take the long view of history when confronted with the difficulties of any particular day. But taking the long view does not diminish the suffering of those who are right now being persecuted for their faith or reduce the urgency of our obligation always to bear witness to the truth of the Gospel. There are many places in the world today where being a Christian is to be a target of discrimination, oppression, and violence. More men, women and children died in the 20th century because of their Christian faith than in all the nineteen centuries before, and the the first decade of the 21st century has shown that the making of martyrs goes on and on. We should be grateful that we do not live in a land where churches are blown up, where Christians are murdered in the street or sold into slavery and forced to convert to Islam, or where teaching the Holy Scriptures and celebrating the sacraments of the New Covenant is a crime. Such persecution goes on every day, year in and year out, in almost every place where Islamic sharia or Communist dictatorship is the law of the land, and Christians by the thousands suffer unspeakable torments rather than renounce their Lord and Savior. This is an extreme example of what may be called the “Cost of Discipleship”, and it can serve as an effective inspiration for us to ask what we would sacrifice for the sake of our faith. Put in this context, our present struggle against the overreaching arrogance of the Federal Government seems a small matter, but it is precisely in such small ways that the persecution of Christians has ever begun. Every Catholic bishop in the United States is united in rejecting the decision by the President and the Secretary of Health and Human Services that would classify as non-religious institutions all of our hospitals, clinics, colleges, and universities simply because they serve people without regard for their religious identity. It is this decision by the present Administration to define our institutions as non-religious that allows the disputed HHS regulation to force the Church to pay for procedures and medications that are intrinsically immoral through the health insurance we provide for our employees. And that is the heart of the arrogance of this disastrous decision: the Federal Government, not the Church, will decide what is and what is not a religious institution. In the two millennia since the Lord Jesus gave us the Great Commission to preach the Gospel to the ends of the earth and celebrate the sacraments until he returns in glory, the Church has encountered opposition of some sort in every time and place. And this is no surprise: Christ warned us that it would be so. But in the Church’s long struggle to secure her liberty and fulfill her divine duty, the United States of America has long stood as a rare example of how people of every faith and no faith can live together free of compulsion from the State. That is until now. Our rare example of religious freedom respected by the State is in grave danger of becoming yet another place where princes, potentates, czars, commissars and imams decide for others what is and what is not a part of their religion. And the main weapon being used against the liberty of the Church in this present fight is one about which Pope Benedict XVI has been warning us for years: the dictatorship of relativism. “We hold these truths to be self-evident, that all men are created equal, that they are endowed by their Creator with certain unalienable rights, that among these are Life, Liberty, and the pursuit of Happiness.” Can you imagine these stirring words of our Declaration of Independence being written today by anyone in our government who is responsible for the disputed HHS mandate? The very notion of self-evident truths is trod underfoot by the dictatorship of relativism, and the cultural toxins of skepticism, irony and cynicism have all but excluded any appeal to right reason from public life. My friends, the Church is not a political party, and the Gospel is not an ideology. We are the children of God by adoption, called into communion with God and with each other in the mystical Body of Christ and charged with the sacred duty to proclaim Jesus Christ as Lord to all nations. To fulfill that duty, the Church has ever sought the freedom to conduct apostolates of many kinds: schools, colleges, universities, hospitals, clinics, charitable services, nursing homes, etc. We do these things not because the people we serve are Catholics but because we are Catholics, and no matter whom we serve, the institutions sponsored by the Church are truly religious because it is in obedience to the teaching of the Lord Jesus that we do these things. Insisting on the freedom to conduct our own institutions according to our faith is not an illegitimate imposition of the Church on the State; it is an elemental principle of justice. This simple precept, once a self-evident truth, is now under assault by the Federal Government, and it is our duty to resist this campaign against religious freedom with every means at our disposal. For us, right here and right now, this is part of the Cost of Discipleship. As we enter Holy Week, let us be mindful of the age-old struggle between the Kingdom of God and the kingdoms of this world, so that we may have clarity about which Kingdom claims our first allegiance. 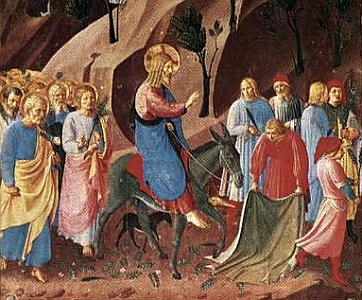 The Mass of Palm Sunday opens with an acclamation that helps us find that true allegiance: Hosanna to the Son of David; blessed is he who comes in the name of the Lord, the King of Israel. Hosanna in the highest. Praised be Jesus Christ! Now and for ever!